In this May 10, 2017, file photo, Danny Fujikawa, left, and Kate Hudson arrive at the Los Angeles premiere of "Snatched." Hudson and her musician boyfriend Fujikawa announced the birth of their daughter Rani in October 2018. The 3-month-old baby girl is Hudson's third child and her first with Fujikawa. 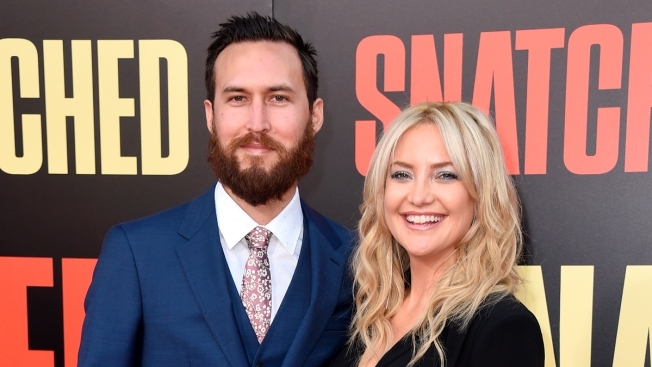 Actress Kate Hudson took to Instagram on Monday to address confusion about her recent comment that she is taking a "genderless" approach to raising her 3-month-old daughter Rani. Comments were disabled on the post. Rani is Hudson's only daughter and her first child with boyfriend Danny Fujikawa. Her two sons, Bingham Bellamy, 7, and Ryder Robinson, 15, are from previous relationships. Hudson said she wanted to clarify that she isn’t using “some new age method” to raise her kids, as some people might have believed when reading the headlines about her AOL interview.